Following on from my post the other day about making your own tea bags as a Christmas present, I’m back with another make your own present idea. 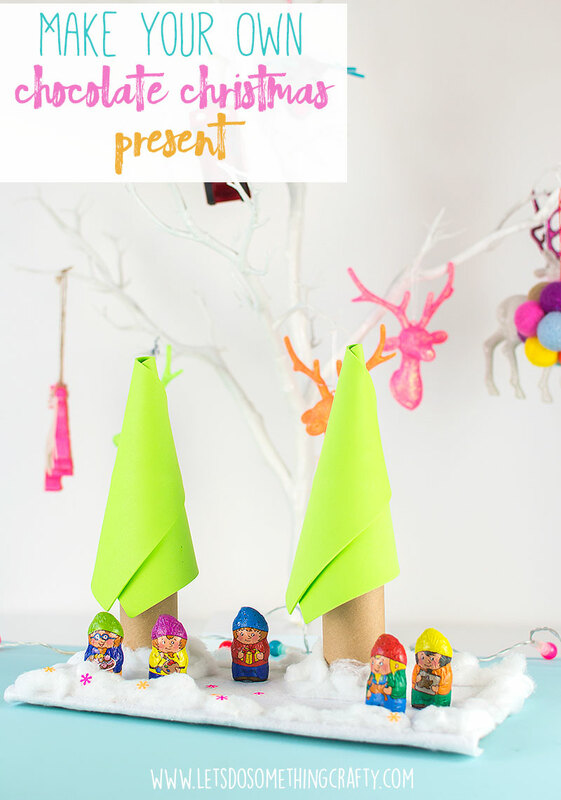 This chocolate gift is super quick and easy to make as well as costing next to nothing. It would make the perfect Christmas present for teachers or grandparents and can be displayed on window sills / fireplaces until the big day as a decoration. The chocolates have been stuck down so that you can pick the entire thing up and carry it around without anything falling over. Making your own Christmas presents is a really nice way of keeping costs down and it also shows you’ve spend some time thinking about that person and what to make them. You don’t have to be particularly crafty either, this list of DIY gifts has lots of ideas, some as simple as putting something ingredients in a jar. It’s also a great way of avoid busy high streets at this time of year, I know I’d much rather by indoors with a hot drink than traipsing around shops in the cold. Start by covering the piece of cardboard in PVA glue and sticking the white felt on top of it, my piece was big enough to cover the edges too. 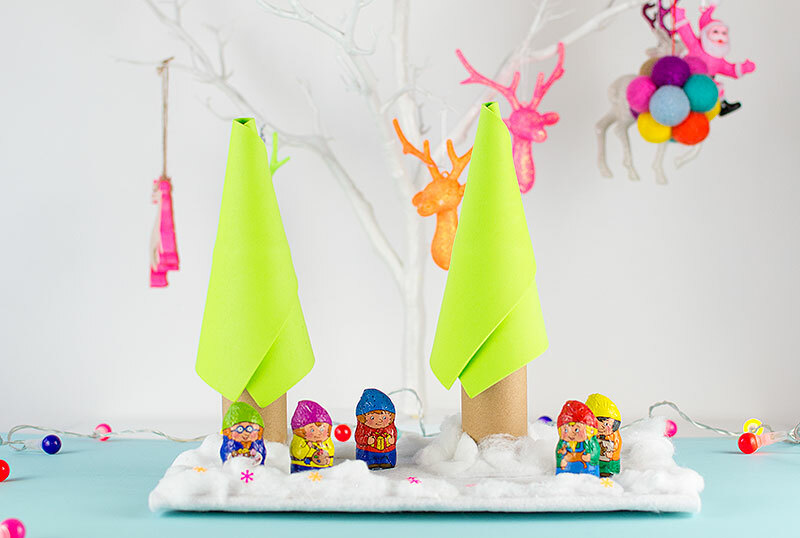 Then use the glue gun to stick the cardboard tubes on top of the felt. Roll your green foam up so that it looks like a cone and use the glue gun to stick the top corner down and hold it in place. Then push the cone shape on to the cardboard tube, I didn’t glue them as they sat in place really well without moving. Glue cotton wool all around the trees and the edges of the cardboard to look like snow. Then glue on the chocolate figures using a blob of glue from the glue gun. Obviously the glue coming out is really hot so I left it for a few seconds to cool down before pushing the chocolate on so it didn’t melt the bottom. Then if you wanted to you could scatter some colored snowflakes around the bottom, this is optional but we found it added that little something extra. You could also write a little ‘Happy Christmas’ note on a piece of card and stick it on. 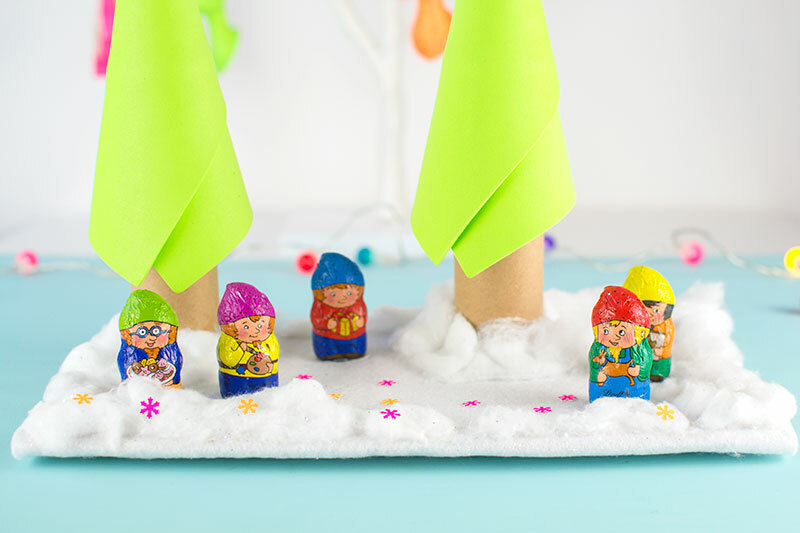 Make A Fat Quarter Christmas Stocking In 15 Minutes! If you are looking for family friendly crafts or crochet tutorials then you've come to the right place. Take a look around and hopefully you will find something to inspire you. I blog about our family life over on Along Came Cherry so you can find out more about us there. Handmade Flowers Using Sticks: Simple Tutorial! © 2017 - Let's Do Something Crafty. All Rights Reserved.